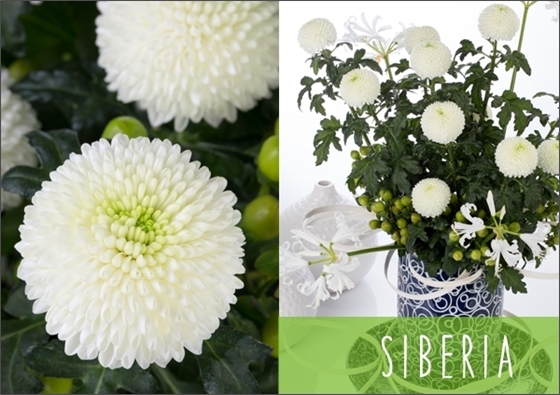 The disbudded chrysanthemum Siberia is a new white novelty of Deliflor. Siberia refers to a cold, white, icy, rough landscape which suits this firm, white pompon perfectly. The strong flower has good transportation qualities and an excellent vase life. A cast-iron variety! The green centre of Siberia provides an extra fresh appearance. A pompon that certainly stands out in the white segment. Siberia will be introduced by Zentoo in week 13 (March 28th). • Amounts: approx. 9.000 stems a week. Images of Siberia can be downloaded from the image bank on our website.